Monson: The Utes have studied Washington’s mistakes and their own going into the title game. We’ll soon find out what they’ve learned from them. (Trent Nelson | The Salt Lake Tribune) Washington Huskies running back Myles Gaskin (9) runs the ball as the University of Utah hosts Washington at Rice-Eccles Stadium in Salt Lake City, Saturday Sept. 15, 2018. There are some positive indicators for Utah in the reviewing of Washington’s three defeats this season and in the Utes’ own progress, indicators that show the requirements for a win against the Huskies in the Pac-12 championship game are well within Utah’s capabilities. The past U-Dub blemishes include a 21-16 loss to Auburn, a 30-27 overtime defeat at Oregon and a 12-10 scrap with Cal. All of those games were played away from Husky Stadium, as will be the title game. Apparent from the final scores, defense is significant against this particular iteration of the Dogs. The lowest-scoring victory the Huskies earned was against the Utes the first time around at Rice-Eccles, when they scored 21 points. In all of their other wins, they managed at least 27 points and usually more. In the losses, Washington’s run game was limited, with the exception of the Oregon outlier, and that’s exactly what Utah’s D specializes in. Kyle Whittingham’s No. 1 goal always is to stop the run. He’s said that, underscored it, since the time he took over as the Utes’ defensive coordinator a thousand years ago, and it’s never changed, straight through all of his seasons as head coach. He came out of the womb demanding to stop the run. Auburn held the Huskies to a mere 102 rushing yards, 3.1 yards per rush. Cal allowed just 91 yards, an average of 2.8 yards. When the Utes lost to the Huskies in September, they yielded 172 yards on the ground, an average rush of 4.2 yards. That wasn’t good enough in the first game and it won’t be in the second. Utah will have to slow Myles Gaskin, no small task considering Gaskin is the only Pac-12 running back to have gained more than 1,000 yards in all four of his seasons. He put 143 yards on the Utes at Rice-Eccles, averaging 4.8 yards, and scored a 38-yard touchdown. Against Auburn, Gaskin gained 75 yards. Against Oregon, he gained 69. Against Cal, he did not play. 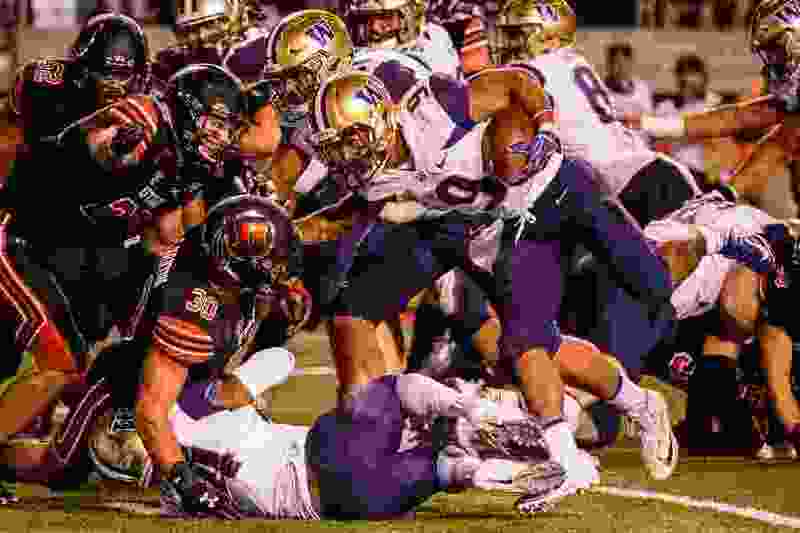 In Gaskin’s most recent game, the Huskies’ win over Washington State, the game which propelled Washington into Friday night’s title game, the running back gained 170 yards and scored three touchdowns, including an 80-yard run on the game’s decisive play in the fourth quarter. UW quarterback Jake Browning said after that game, which was played in a snowstorm, that during it, all he did was hand off to Gaskin and watch him scamper up the field. That’s the last thing the Utes want to see. It is what they must avoid. Browning is another point of emphasis for Utah. In none of the Huskies’ losses did the quarterback throw for more than 300 yards, and in the defeat at Cal, he threw for just 148. He was intercepted in each loss and sacked a total of eight times. Which is to say, the Utes’ front six will need to pressure the veteran QB, and the backend should look to do some ballhawking. Even then, success won’t come easy. Jason Shelley and the Utah offense will be required to carry their load against the Huskies, as well. If the first Washington game proved anything, it was that Utah must take advantage of its opportunities on attack, not chucking everything onto the backs of the resistance. The Utes were out-gained in yards on the ground (172-123) and through the air (155-138) in that game. Too many of their drives were short-circuited, as indicated by their picking up just 13 first downs. Washington possessed the ball longer and Utah turned it over three times. That will not work in the title game. Utah’s offense has evolved over the season, certainly since that first meeting with Washington, and every bit of that ascension will be called upon now. Even when the Utes struggle in the early parts of games, as they did against BYU, they seem capable of organizing themselves, regenerating, and bouncing back. Shelley’s insertion into the starting quarterback role has smoothed some undulations, and impressed Whittingham. Even though the Utes are relatively young all around this season, they have dutifully followed the team’s veteran leaders through adversity. In a setting like this one, with a league championship and a Rose Bowl berth on the line, against a team that already has beaten them once, they must rely again on the strong, calming influence of those vets.